Experience this new installment of mosaics puzzles in rainbow colors! Collect and use the new sun power-up. Enjoy new features and an improved map layout that shows your achievements along with puzzle images. Following the tradition of exciting multi-color gameplay, this new collection of custom built puzzles will bring you hours of fun and discovery! 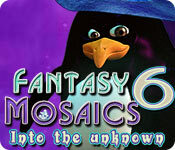 Fantasy Mosaics 6: Into the Unknown is rated 3.9 out of 5 by 20. Rated 5 out of 5 by mnkysmom from Great addition These mosaics are such fun. Re-playable over and over. I am so happy to see a new one at the offer! These color change mosaics are great for those times when you just want to relax and exercise your brain a bit. Love it!! 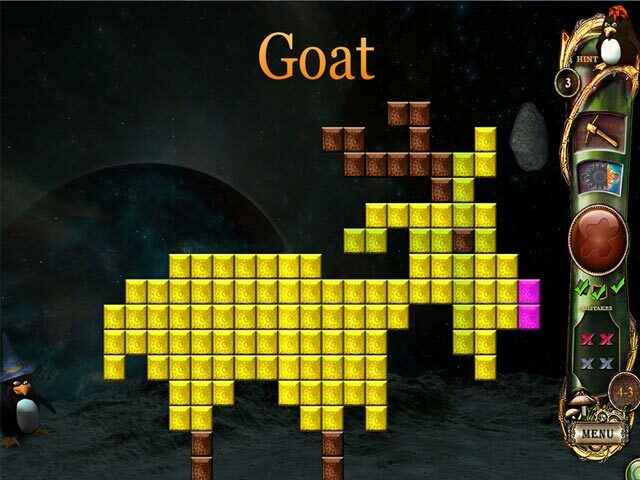 Rated 5 out of 5 by Typhlosion24 from Fun Nanogram Game (Based on Demo) Fantasy Mosaics 6 is a well made nanogram game. The controls are simple and the game has an auto-complete feature that marks all empty squares once you find all the squares contained in a line. A very interesting feature in this game is the power ups that let you do things like check if a square is empty or not w/o being penalized. The music is very good; it's very relaxing. I didn't gave a score to the story since it's barely present in the game. The only feature I wish this game had is the ability to mark squares as possibly filled so you can test out different possibilities without being penalized. Rated 5 out of 5 by DRAGONWYN from Growing to love the colours I didn't like the color format when it came out in #4. I tried it again in #5 and liked and bought it. I've grown to love the different way to play. I played the trial and will be using my latest game credit on this one. Lots of fun. Rated 5 out of 5 by jil1 from more and more and more...please! I love mosaics... i´d rather prefer 1, 2 and 3, but this one is gorgeous too. With one more tool, the sun (altough I practilly didn´t use), beautiful and bright colours and interesting figures. I´m already waiting the next... I recommend this game. Rated 5 out of 5 by sunnyglow from A NICE SURPRISE FOR OUR "SPACE CADETS" ON GRUMPY CAT MONDAY Faster than hyperdrive, we are off to outer space on this Grumpy Cat Monday. 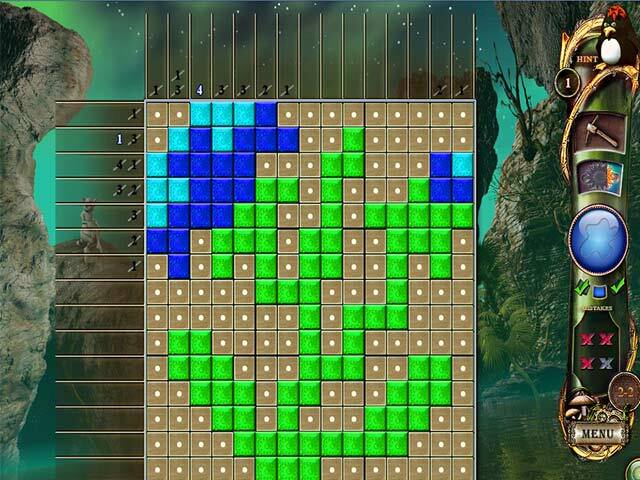 An awesome game from my favorite dev for this type of puzzle. Thanks BF for more of these nonograms, AKA (Paint-by-Number, Pic-a-Pix, E'Kaki) or whatever you wish to name them. This is another form of Sudoku. These are some of my favorite games. They are not for everyone; however, if you enjoy math and formulating ratios, try this game. It is rather cool to end up with a picture at the end. I wish this dev would develop a theme-based Kakuro puzzles as well. However, that may be a little difficult. HERE ARE THE DETAILS: THEME: Yeah! Outer space and aliens! Can you really have one without the other? I so want to travel to other planets (maybe as an ambassador) and of course, I am still awaiting my first ever alien experience. A road trip to Skinwalker Ranch in Utah this summer should do the trick. 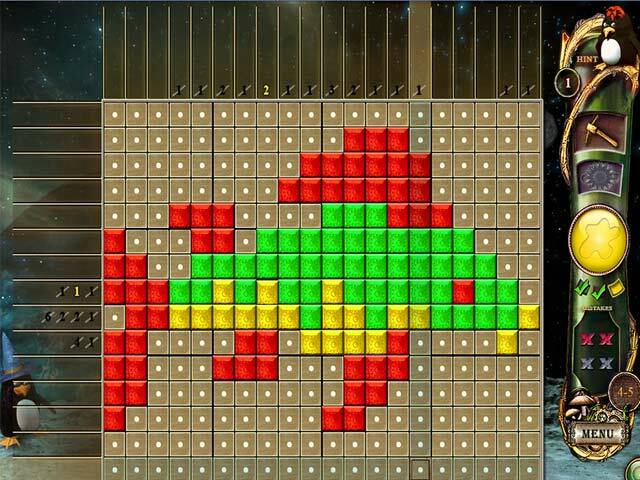 However, in the meantime, I can play this puzzle and try to locate a decent space helmet for Gumpy Cat. Wouldn't he be adorable with a "bubble" hat on his head? LEVELS: You have your choice between Casual and Advanced which is wonderful for those of us who are experienced with this type of puzzle. EXTRA GOOIES: It is colorized and has autofill, which makes the game so much easier to play. I believe these grids go from 10x10 to 25x25, but since i have not played this entire game (Geesh! - give me time) but I could be wrong. Rated 5 out of 5 by pennmom36 from Keep 'Em Coming! They've done it again! The mosaic's are bigger and brighter than ever before! That penguin sure get's around, and has managed to find the perfect spot for his garden on another planet. Just like the other 5 Fantasy Mosaics, every step you take in the game will help you explore his new found (and in this case intergalactic) planet, and discover it's inhabitants. This is a grid type game based upon logic and deduction. There are numbers on each row and column that indicate the number of filled tiles, each group of filled tiles must be separated by at least one blank tile. Once you fill in all tiles with one color, the next color will automatically open up, or you can toggle back and forth between the colors which sometimes makes the puzzle easier to figure out. Some of the filled tiles contain bonuses for extra hints, more mistakes allowed, or pick axes to find out the state of a tile, and a Sun which reveals any square you use it on, and all the squares around it. You can choose to play this game in Casual where the numbers are crossed off one by one, or, Advanced which only crosses off the numbers when the entire row is complete. You can earn Gold, Silver or Bronze achievements for each grid completed, according to the time it takes you to finish the puzzle. My only complaint is that your progress isn't saved if you exit the game with an unfinished puzzle. Enjoy! Rated 5 out of 5 by csmith116 from Great Game One of my favorites I always buy. HIdden object games are my faves but I never seem to be able to pass a Mosaic by. I go back and replay. Not a big challenge but designs give great ideas for plastic mesh needlepoint I do. Rated 5 out of 5 by romany09 from Favorite Mosaic Puzzles I have really been enjoying the Fantasy Mosaics puzzles since they began using a board where we get to change the color tiles in order to figure out the puzzle. Number 6 has really good music and I like how they have now added the finished picture when a mosaic is completed. The level of challenge may have become less difficult for me since I play them so often and have increased my skills, but I intend to keep buying them as they create them!